Reusable Coffee Cups are becoming very popular with consumers as they make the switch from single-use cups. It is estimated that 16 billion coffee cups are thrown away worldwide every year and we are all more aware of the environmental damage this causes. It only takes a small change to make a big difference so create a Branded Reusable Coffee Cup to make it easy for your employees and customers to be part of this change. Single-use coffee cups are already being phased out by many coffee shops, cafes, supermarket retailers like Waitrose and even the Houses of Parliament. Chains like Starbucks are introducing a 5p levy on single-use coffee cups and both the UK and EU governments are looking at introducing a “latte levy” in the future. 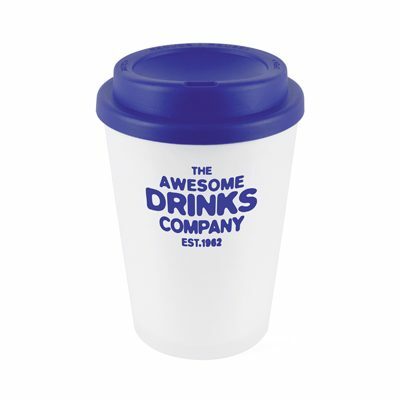 If you’re looking for an eco-friendly promotional product for your business, our Branded Reusable Coffee Cups are a great choice. These practical coffee cups will be reused many times and will be seen by many people. Not only that, they will do less damage to the environment and help to save recipients money as they won’t have to pay any charges for single use coffee cups. Made from double walled white frosted plastic, this take out style reusable coffee cup comes complete with plastic screw top lid with sipper. 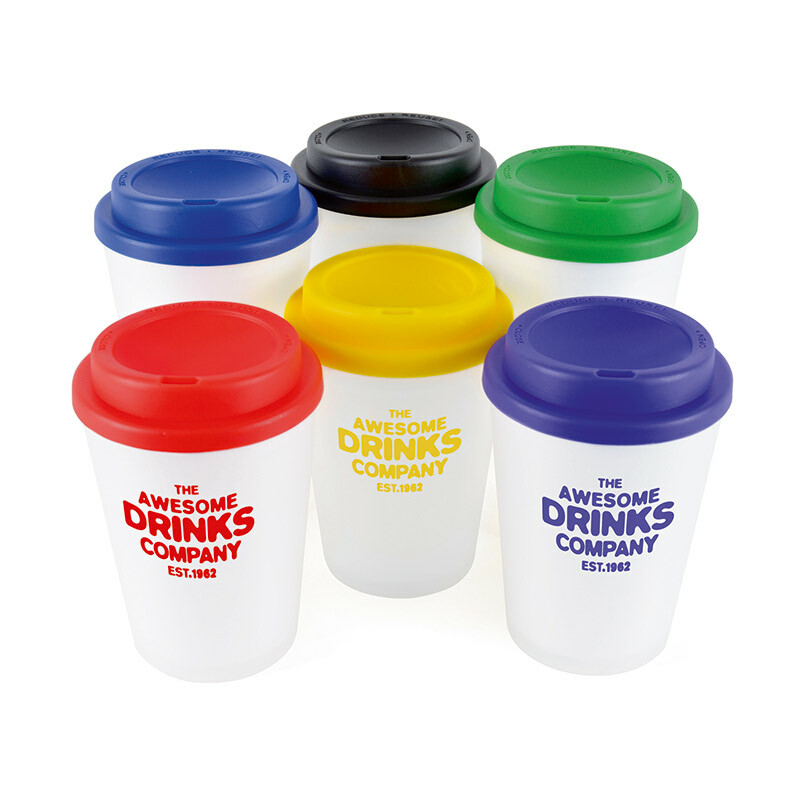 Choose from 6 different colours for printing and the plastic lid. Dishwasher and microwave safe. Conforms to articles in contact with food testing. BPA free. This is a great economical choice for a Branded Reusable Coffee Cup. 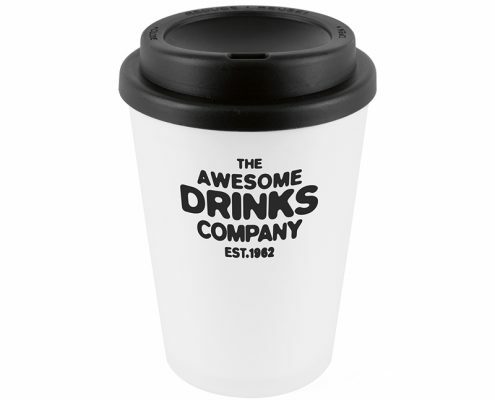 If you require a premium option with more print & colour options, check out our other range coffee cups. 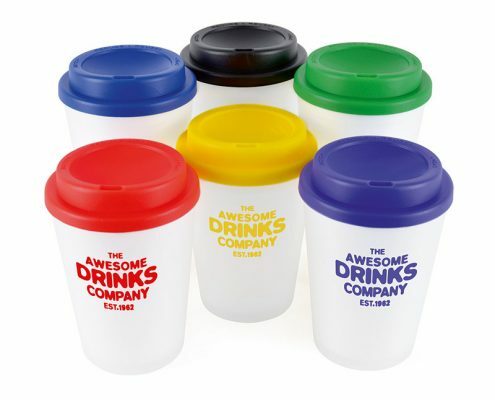 The perfect branded product for coffee shops, cafes, bakeries and fast-food restaurants. Charge a single-use coffee cup levy and sell your Branded Reusable Coffee Cups in-store. Offer a special deal to encourage sales and generate income. A mobile barista is becoming popular at events. Give away a branded coffee cup to each customer – it will be taken home from the event and remind clients and customers of your brand every time they reuse it. Product Size 140 x 93 mm dia.